Tasty, flavourful, and super easy to make in the Instant Pot! 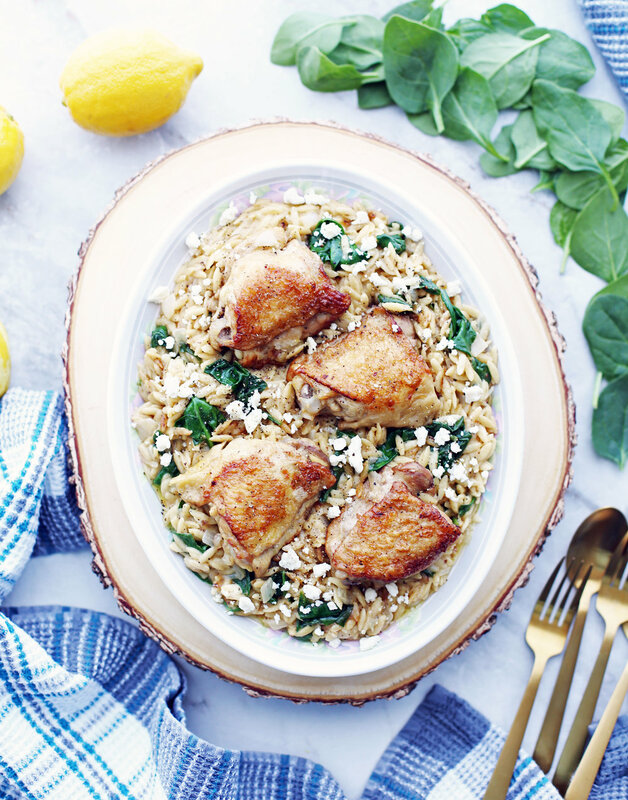 This lemon pepper orzo (aka risoni) and chicken dish is perfect for a weeknight meal. Happy Wednesday! I'm back with another Instant Pot recipe. I'm obsessed with using this piece of kitchen equipment, especially making all different kinds of soups, but this time, I decided to make a pasta dish using delicious orzo and chicken thighs. What makes the Instant Pot great for this dish is how quickly it heats up and how even the heat is distributed. You can brown your chicken thighs in no time and then finish cooking them along with the orzo so everything is cooked together with only one pot (and a sheet pan if you choose to crisp up your chicken skin) left to clean up. Did you know? Orzo, which means “barley” in Italian and is also called risoni, is not a grain, but rather pasta that is shaped like a large grain of rice. I find orzo really takes on the lemon flavour in this dish, which works perfectly when you want a less-saucy pasta entree. Check out my other recipe where I've used orzo: One-Pot Orzo Pasta with Italian Sausage and Kale. That one is made on the stove-top and is creamy and cheesy and also super easy to make. This time, I've decided to flavour the orzo using a whole fresh lemon and freshly cracked black pepper (so bright and citrusy!) along with tender chicken thighs for added protein. It's finished off with tangy feta cheese (I love cheese) and spinach (gotta get some greens in). It's just so simple to prepare and filling too. All the ingredients in this easy Instant Pot recipe! Scroll down for the ingredient amounts and full instructions. The chicken thighs are golden-brown on both sides after being seared in a butter and olive oil mixture. It will help seal in juices and improve the flavour of the chicken. Tip: Make sure that all the ingredients prepped and ready before you start cooking. It will help make cooking go smoothly (e.g. prevent burning stuff or forgetting to add something important in). Another tip: It's much easier to zest then squeeze the juice out of the lemon. I used a microplane grater/zester to zest the yellow peel off the fruit before using using a mini citrus juicer to get as much juice as I can out of the lemon. You can also use the smallest sized hole on a box grater or a vegetable peeler to peel the yellow skin and then finely chop the skin into tiny pieces using a sharp knife. Try not to get any of the pith (the white layer between the peel and fruit) when you zest as it is bitter and unappetizing. Sauté the onions and garlic and then stir in the orzo with lemon zest, lemon juice, black pepper, salt, and chicken broth before placing the chicken back in. After it is cooked in the Instant Pot, remove the chicken thighs from the pot (and optionally broil for crispy skin). Then, stir in fresh spinach and feta into the orzo. So creamy and flavourful! Question: My instant pot gives me the burn signal just before reaching pressure. I thought I needed to let it cool after sautéing everything but even when I did that, I still had the burn issue. Any tips on how to prevent this from happening? Answer: Are you making sure you fully deglaze the pot after sautéing? Leaving any brown bits behind can trigger the burn signal. You can also try layering the orzo on top before sealing instead of stirring it in (step 5) as sometimes starchy ingredients can give you a burn message. In other words, after sautéing, press "cancel," stir in the broth and seasonings, place the chicken back in, and then spread the orzo into a thin even layer on top, making sure the orzo is submerged in broth (press it down slightly if needed). Delicious and filling: The orzo is loaded with fresh lemon flavour, spiciness from black pepper, salty and tangy notes from the crumbled feta cheese, and tender, healthy baby spinach. It is perfectly matched with the crispy skinned, juicy chicken cooked in the seasoned broth. Made from simple ingredients: Easy to find and affordable ingredients that are common in most supermarkets. For example, bone-in, skin-on chicken thighs are usually cheaper than their skinless counterparts or chicken breasts. Plus, I believe that bone-in chicken packs more flavour than boneless. That being said, feel free to substitute the chicken with the cut of your choice, but be mindful of cook time as it might change. Easy to make: Everything (with the exception of broiling the chicken for a crispier skin) is made in the Instant Pot using two basic functions: "sauté" and "manual" (high) pressure. No complicated steps at all, which makes a lovely weeknight or lazy day meal. Quick to clean-up: The vast majority of cooking is done in the Instant Pot, so clean-up is done in no time at all. Great for meal prepping or as leftovers for the next day: Throw in a side of extra veggies and cook up a few more chicken thighs and you have a super filling meal for days! I hope you enjoy this recipe! If you try it out, please leave a rating and comment below or tag me on any of my social media. I love to hear from you! Dry chicken with paper towels and lightly season both sides of the chicken thighs with salt and pepper. Set the Instant Pot to "sauté". Pour the olive oil and butter into the pot, swirling the butter until it melts. Using tongs, place the chicken thighs in the pot and brown chicken on each side, about 4-5 minutes per side (you may need to move chicken around so it doesn’t stick to the bottom of the pot). Remove from the pot, leaving the oil behind, and set aside. Add in the onion and garlic and stir frequently until the onions are softened and browned, about 3-4 minutes. Add 2 tablespoons of chicken broth to deglaze the pot, stirring and scraping the bottom of the pot to remove/dissolve the brown bits. Press “cancel” to turn off the Instant Pot. Stir in the orzo, lemon juice, zest, black pepper, salt, and remaining chicken broth, making sure to distribute the ingredients throughout the pot. Place the chicken thighs back into the pot with the other ingredients. Seal the Instant Pot and cook at high pressure (“manual”/"pressure cook" function) for 6 minutes. After it is ready, allow natural pressure release for at least 10 minutes before a quick pressure release to completely depressurize (until floating valve drops). Open the Instant Pot and remove the chicken thighs from the pot. OPTIONAL step: Place the chicken on a baking sheet lined with aluminum foil. Arrange the oven rack about 6-7 inches from the heat source and preheat the oven broiler. Broil the chicken until the skin crisps, about 2-4 minutes (check often). 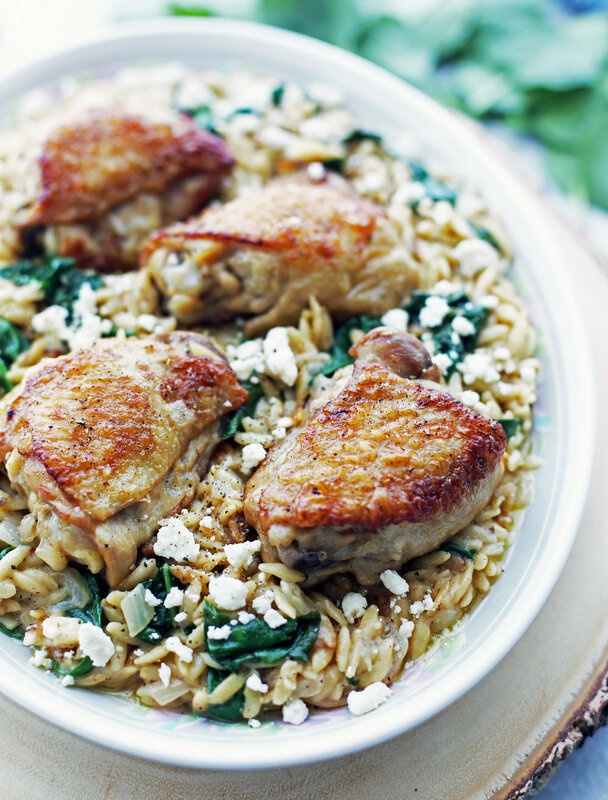 Stir the feta and spinach into the orzo. Taste for additional salt and pepper. Plate and top with more feta cheese if you like. Best served immediately. One lemon equals around ¼ cup of juice and 1 tablespoon of zest. Add more or less depending on how lemony you like your orzo.